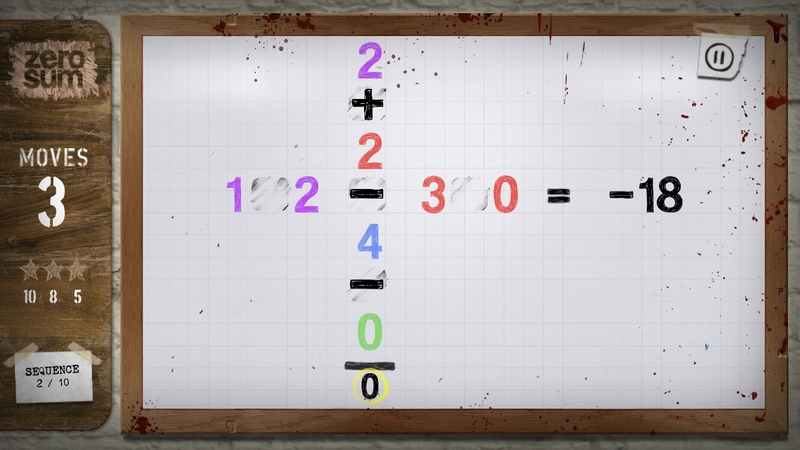 The pitch for Sean Kearney’s game, Zero/Sum, is that it’s a math puzzle game combined with the cheesy storyline of an 80’s B-movie, complete with live acting and absurdity. I confess, I wasn’t all that excited about the math, but I love a good cheesy movie, and it was hard to pass up on the opportunity to cure cancer with puzzles. It turns out, the game delivers on its B-movie promises, complete with terrorists, sarcastic doctors, even a ghost! Unfortunately, it feels half-baked everywhere else. At first, I was totally on board with Zero/Sum. 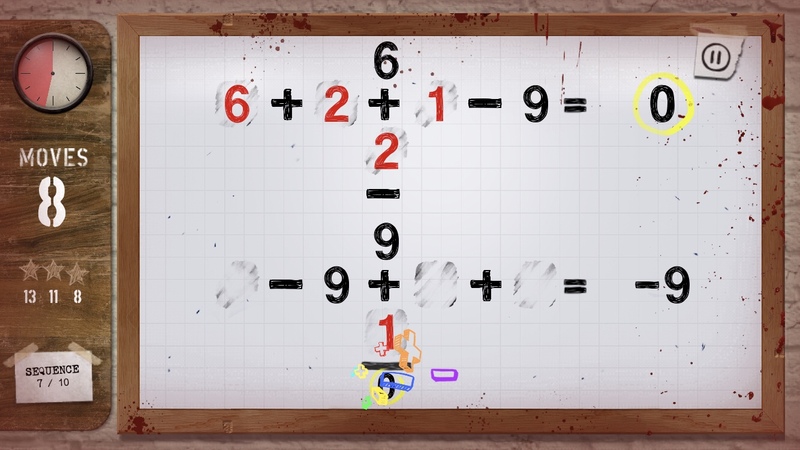 It seemed like a solid puzzle idea, where you’re given a bunch of numbers on a white board and you have to put in the plus and minus signs to create an equation that equals zero. Every equation in the game must equal zero, hence the name Zero/Sum. 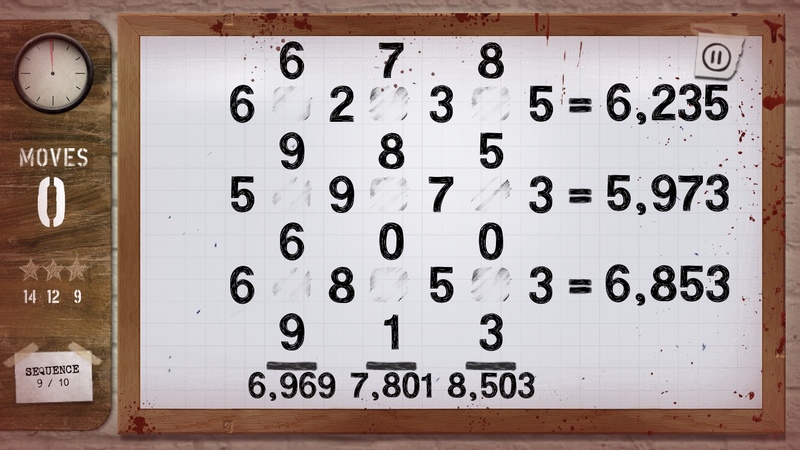 For instance, given the numbers 6 4 5 5, you would make it 6 + 4 – 5 – 5 to get 0. It might not sound all that interesting at first, but it gets trickier when you realize that you don’t always have to put a symbol between two numbers. You can leave a space between them, creating a two-digit number. For example, given 9 3 9 3, you would make it 93 – 93. Or with 7 8 0 1, you’d make it 7 – 8 + 01. Then there’s the levels that have criss-crossing equations that share operators. So you have to think about how each symbol will affect all equations instead of just jumping right in to solve one before even looking at the others. It’s actually a solid foundation for a puzzle game. But my enthusiasm quickly fizzled when I noticed the move counter, which led me down a path to frustration and disappointment. I’m not against move counters in games if they make sense and offer something of value. In fact, they can often give the player more focus, some guidance in a game where there otherwise isn’t much. They can make a loose puzzle feel tighter and better. 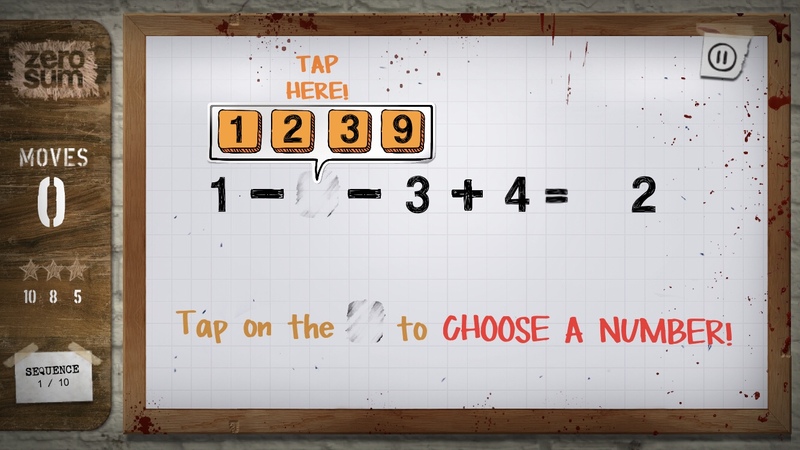 Some good examples would be Causality and Calculator: The Game, another math puzzler. In both games, the move counter forces you to solve the puzzles the way the developer intended, instead of taking as many moves as you’d like to get there. It makes for a better game. In fact, I started playing the new Bloki yesterday and it was a rare instance where I missed a move counter that could give me some guidance. But that doesn’t mean every puzzle game benefits from one. Sometimes it’s meaningless and other times it ruins the relaxed feel of the game. With Zero/Sum, it falls closer to being meaningless, but other design decisions make it outright rage-inducing. While it’s true that in some instances the move counter can guide you to the right answer, such as in the screenshot below where only one symbol is needed, the three-star system is mostly pointless. 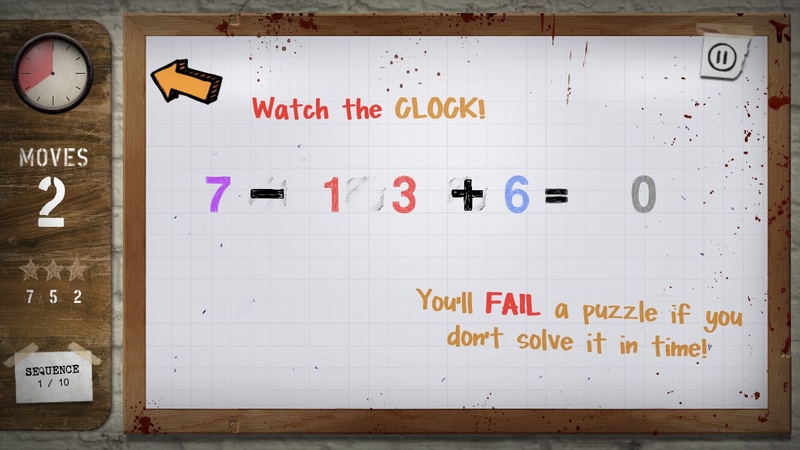 This is because, for most of the game, once you solve the puzzle you’ll be able to recreate it in the minimum number of moves without changing your solution. It’s not like a block-pushing game where you took the long way around when there was a shorter solution. The game simply punishes you for trying to work out the solution on the game’s white board instead of in your head. Because if you make a mistake and need to change or remove a symbol, that wastes a move. You will most likely come to the same solution in the end, but you’ll get fewer stars for making mistakes on the way. This would normally be something I could easily ignore, as, like I said, it should be easy enough to replay the level and get all three stars. Notice I said should be. In pretty much every other puzzle game I’ve played where the levels aren’t randomized each time, you can restart a level when you mess up and don’t get a perfect score. That’s how puzzle games work. If there’s a specific way to solve a level, you restart as much as you want until you get it right. But not here. If you mess up, tough luck. You have to keep your higher move count and continue on with the chapter. There’s no restart button. Your only option if you want to replay a level to get three stars is to restart the entire chapter, cutscenes included. So if you got three stars in all but one level, you still have to play through it all again to get the missing stars. Again, this wouldn’t be the end of the world on its own, as surely people can enjoy the game without worrying about the stars. But there’s more. The way the game is designed doesn’t just mean you can’t restart a single level. It also means you can’t take breaks mid-chapter and continue where you left off. Besides the first one, all eight chapters have ten levels. This means you have to watch the cutscene and play through all ten levels in one sitting or you’ll be forced to restart the chapter. Once the game leaves your device’s memory or you quit to the main menu, there’s no way to resume where you left off. There’s no level select screen. You can only choose a chapter. Considering this is a mobile game and people do all sorts of things between games, such as take calls or texts, this really is inexcusable. I mean, what is the worth of a mobile puzzle game that you can’t pull out for a minute or two while standing in line at the supermarket? And it’s only made worse by the unskippable cutscenes before each chapter. Yes, you can quickly tap to get through the dialogue faster, but you can’t just tell the game to skip it altogether — no matter how many times you’ve watched it. This means, as much as I was enjoying the cheesy story about using math to cure cancer, I started to dread the cutscenes, knowing they would become a big time-waster. But wait! I’m not done complaining about this game. Sorry! The progression of the puzzles from chapter to chapter is also almost nonexistent. The game instead tries to pull a fast one on you and make you *think* things are getting more complex and more interesting, when they’re really not. For instance, one chapter adds a timer. The idea is that you have to complete the level before the timer runs out or you have to restart it. This is meant to make things more challenging, but remember that move counter? All the timer does, really, is reset that move counter for you. Yeah, it erases the work you’ve done, too, but by then I’d learned not to do anything until I worked it all out in my head first. So the timer changed nothing. All it did was give me an easier way to restart a level before I completed it. I came to prefer the timed levels because I knew I could mess around without worrying about the move counter so much. But it was also a drag having to wait for the timer to run down when I knew I messed up. Still, better than restarting the whole chapter, right? Another chapter has you working against the clock in a different way. When you place an operator down, you have only a few seconds to complete the equation or it will disappear. And yes, it still counts as a move if it vanishes. All this did was mildly irritate me. It in no way made the puzzles more interesting or challenging, just more annoying. Instead of taking my time to place each operator carefully, I had to fumble with them and risk messing up and then, yes, restarting the whole chapter if I wanted my three stars. It changed nothing about how I solved the equations. I still did them in my head before touching the screen. But there was just a higher likelihood now that I would botch something up because I’m rushing. I finally got to the sixth chapter, where the game tried to shake things up with a new mechanic. Instead of placing symbols down, the symbols are on the board along with some permanent numbers. There are also some numbers missing, and you choose between four different numbers in each slot. The problem with this is that most of the time these puzzles were too easy, especially for so late into the game. 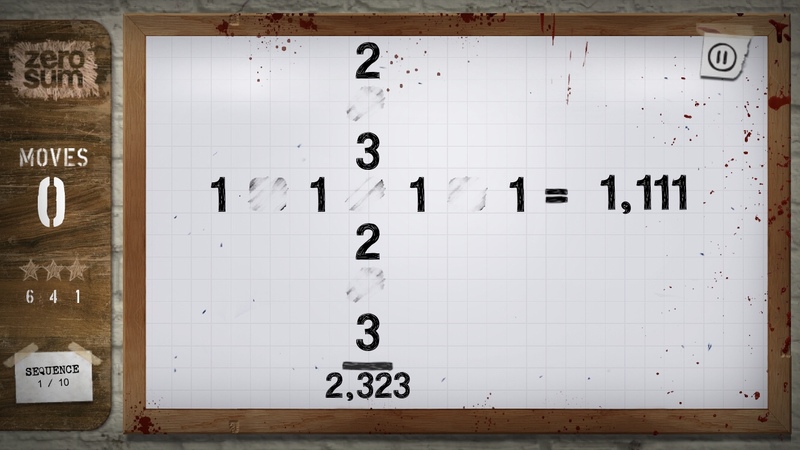 Unlike the symbols that are shared between criss-crossing equations, the numbers only matter per equation. So having multiple equations with those in one level don’t really mean much, at least on their own. The numbers also make things way too easy, as you can just look at the sum and then choose two numbers that add up to it, for the most part. There were maybe a handful of levels where the numbers actually gave me pause, but they were too few and far between to justify the amount of real estate given to this mechanic. It felt like it was tacked on because they didn’t know what else to add to the game. The final chapter combines all these mechanics and it occasionally does show the game’s true potential. But I think it takes too long to get there and doesn’t explore it far enough. I would have liked to see levels where you place both symbols and numbers. Or parentheses that would affect the order of the operations. Hell, I know the game is called Zero/Sum, but I was still hoping to see some multiplication at some point. An entire game based on addition and subtraction is not going to remain interesting without some creative mechanics to shake things up. And timers are just not the answer. There are time trials and daily challenges you can play once you’ve finished the story mode, but again, I don’t feel like enough changes to keep me wanting to come back to this game. The time trials do allow you to mess around as much as you want without a move counter, so they feel more in line with the mechanics. But how many times are you going to want to do math problems that are lacking in gameplay elements? I can just open up a math textbook and do math to get the same satisfaction. A game like Calculator kept things interesting by constantly adding new elements such as inversions, copy/pasting, even portals. That’s what a puzzle game needs in order to remain interesting for more than a short bit. There’s a start of an interesting game here, but it’s just not fleshed out enough, even without all the technical issues. 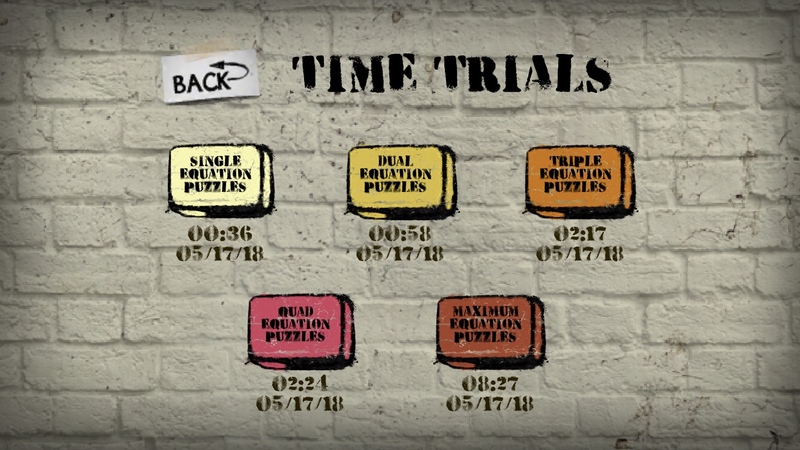 The only time trial levels that feel worth my while at all are the Maximum Equation puzzles that have six criss-crossing equations. But how many times am I going to want to play five in a row without a break when I have so many other puzzle games that are more interesting and value my time more? On top of it all, the music doesn’t stay muted when I shut it and there’s no iCloud sync. I definitely don’t want to play catch-up on a second device after already playing catch-up on my first device! Another irksome thing is that when you’re about to go one move over the limit to get three stars, the game will start making a noise like a ticking time bomb. But there’s nothing you can do about it at this point besides start the whole chapter over, so why is it warning you? And it does this even with the music off. The sad thing is, I really was enjoying the story and cutscenes, as it was just as ridiculous as I expected and it worked with the subject matter. The developer did a great job making a B movie — I just wish he would have brought his A game for everything else. I mean, if none of my complaints above would bother you, by all means grab the game here. Maybe the story will be enough to redeem the game for you. But if you’re not happy when a game wastes your time and you won’t be satisfied until you get all the stars, you may want to skip this one unless and until it gets a major overhaul. 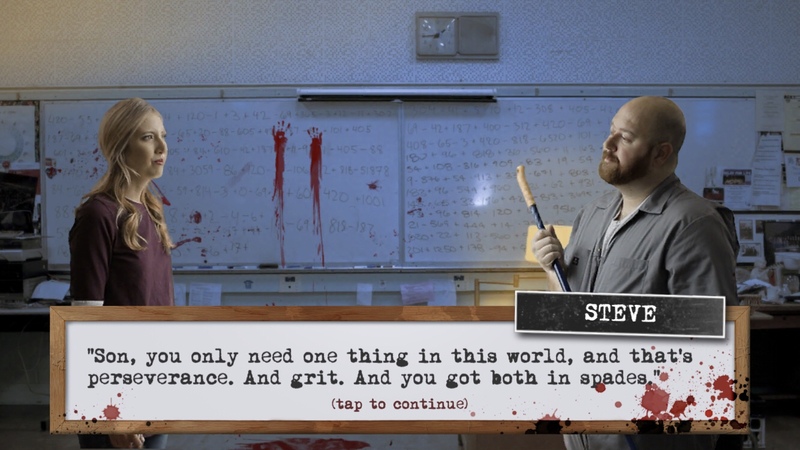 And if you’re stuck on any of the puzzles, you can try my complete walkthrough guide.